Today We are introducing all new Android Application made by Christian Göllner. You might be confused about what this app Actually do, So We will Explain One by One How it Works. With The Help of Flashify you may Flash Boot.IMG | Recovery.IMG and .ZIP packaged Files Easily. Now You may Flash .IMG files even if you don”t have Custom Recovery Like CWM or TWRP, You may just use this app to Flash and Reboot for Taking Effect! But if you want to Flash .ZIP files you need Custom Recovery Flashed on your Device. This App saves all the Recent list of Flashed Files too. 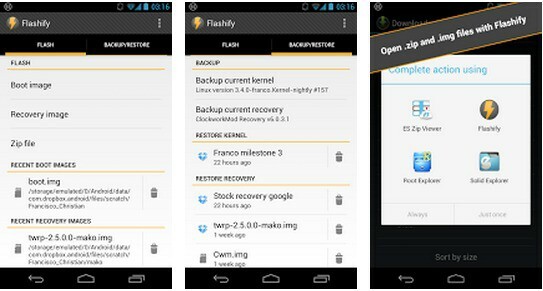 With Flashify you may Backup your Kernel to SDcard or Even Cloud Storage like DropBox! This feature is great improvement rather than previous version of apps. As you have Flashify on your Device you may flash any files anywhere without taking much tension about Device System. This app supports files to flash from Different File manager too.